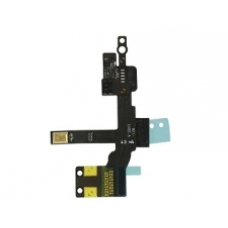 This replacement sensor cable part contains the proximity sensor and light sensor for your Apple iPhone 5. If this part fails then the screen will not automatically turn off when you receive a phone call and place the handset to your ear. Please note soldering is required to install the front Facetime camera on this part from your failed sensor assembly. * Contains Proximity Light Sensor. * Original iPhone 5 Part. * Apple Part Number: 821-1465-A.